Because of Dell Arte ... I’m a Risk junky. … I’m a Risk junky. The year before I went to Dell’Arte in 2009, I was taking classes with these mind-bending clowns in Chicago called 500 Clown (there’s actually only three) who have a no-holds-barred relationship with the audience and each other and perform on contraptions that fall out from under them. Their tenets are: Action, Risk, Audience, Humor. Brilliantly simple. One of them (Paul Kalina) had gone to Dell’Arte, so I took the plunge and moved to Blue Lake the next year. Risk is also one of the tenets of Dell’Arte’s pedagogy: Effort, Risk, Momentum, Joy. And during my time at the school I got to hone my appetite and aptitude for being a danger ranger. My chief interest and joy swiftly became toying, pushing, flicking, prodding, trampling and destroying that ‘sacred space’ between audience and performer - that ubiquitous fourth wall. I also became interested in that moment where nobody in the theatre space - audience and performers alike - is sure of what’s going to happen next. When a performer makes a mistake, is caught by surprise, forgets their line, gets heckled by the audience; when something happens unexpectedly - a moment of pure reality. I learned at Dell’Arte that another way to find this moment is by playing onstage as an athlete and to approach scenes as games. The risk of failure and how players navigate it is a main reason sports are so popular, that risk is what makes crowds sit forward, choose sides, scream and yell. I used to dream of a day where theatre shows could have the same effect as a football game and take place in a stadium with the audience painting their faces, waving foam fingers and cheering and jeering the actor players. The closest modern theatrical medium I’ve found to this is the circus and that’s where I’ve ended up. After I left Dell’Arte I was inspired to take my risk adventuring to the next level. I did this in two primary ways. First, while at Dell’Arte, I had read about this obscure form of grotesque physical theatre called Bouffon in Jacques Lecoq’s book The Moving Body. That stuff looked ballsy and right up my alley. So when I got to San Francisco I joined the only company at the time exclusively dedicated to bouffon in the United States and studied the form extensively with master teachers Giovanni Fusetti and Dodi Desanto. I was driven to become as much of an expert at this form as possible. Bouffon - in my mind - is the riskiest theatrical territory because it requires every single tool in an actor’s toolbox often all at the same time. Bouffons, in their pure essence, are beings that can do and be anything; they are funhouse mirror reflections of the world around them, which requires a performer to be hyper aware and empathetic, reflexively sharp, have a large performative skill set, elite physicality, fearlessness of looking stupid, commitment to portraying taboo subject matter and an immense pleasure in seeking out risky situations like a fiend. Two years ago I started my own company called Antic in a Drain where bouffon has become the heartbeat of my work. These days we don’t wear the stereotypical ‘humps and bumps’ that you’ll see on a lot of bouffons - in my experience it’s more subversive and risky to hide the distortion and I’m interested in using aspects of forms of theatre like bouffon, clown, circus, commedia, etc as means to an end in expressing my own unique vision not as the end all be all vehicle for that vision. The second way I upped the stakes on my journey to Peril Road was by going to the San Francisco Circus Center where I began an (eight years now) pilgrimage to becoming a specialist in Chinese pole, one of the most risky and difficult of circus apparati. The risk of acrobatics is real physical risk. This year I sprained my left wrist, sprained my right finger and broke my right pinky. In the words of my former coach Master Lu Yi, “Training is bitter but the performance is so sweet.” And it’s true: there is no better feeling than hearing an audience roar when I do one of my drops on pole, the energy is palpable and it makes the endless hours in a room training by myself worth it. I live for taking those risks so the audience can experience them. Truth be told, a lot of the time the audience is probably feeling it more than me because I’m often working hard to quiet the voices in my head that are questioning my life choices and predicting what might happen if I accidentally miss. This is another aspect of chasing risk, battling the inherent existential voices - my coach Dominic calls them the “Funny Friends” - that tell me I’m going to fail, that I’m not good enough, that it doesn’t make sense to do it that way. And battle them I do, for these Funny Friends are who will disperse the risk, make me fall, and cause me to make the ‘safe’ choice. For years I’ve been practicing the art of tuning out my Funny Friends, or acknowledging them and making fun of their existence; in doing so I risk going against my own reasoning. I feel grateful to Dell’Arte not only for giving me one of the best years of my life but for helping to foster my addiction to physical and emotional risk which has become the cornerstone of my artistic trip. You’ve made me an addict Dell’Arte! Great job! A few years ago I won the Artistic Risk Award at the Vancouver Fringe Festival for my show The Greatest Monkey Show On Earth. That was probably the most meaningful award I’ve received to date because it acknowledged what I’ve been driven to do all these years. None of my artistic heroes are conformists to one particular style. They have unique visions. Because of my training in the styles at Dell’Arte, and my training and experience since, I’ve acquired enough tools and perspective to channel together my favorite aspects of bouffon, clown, circus, commedia, tragedy and melodrama to create an artistic vision that takes the risk of being authentically mine. Ross Travis is an Actor/Creator, Bouffon, Physical Comedian and Circus Performer specializing in Chinese pole. He recently co-created and performed in Circus Veritas (2017) Inversion: Circus Disobedience (2016) and Salvage (2015) with Kinetic Arts Productions. He has been the ringmaster and Chinese pole artist for Flynn Creek Circus for their 2016 and 2017 seasons. He has toured two seasons with Circus Bella, San Francisco’s premiere one ring circus and has worked with Sweet Can Circus, Velocity Circus, Earth Circus, Vau de Vire Society and Le Cirque Boheme. Ross has co-created and performed in multiple shows with Firefly Theatre and Circus in Edmonton, Canada, including Craniatrium, Panache and Panache: Part Deux. Ross has a performance company called Antic in a Drain which has been touring internationally with The Greatest Monkey Show On Earth; a primate circus extravaganza that takes a satirical bite out of animal/human agency. Antic in a Drain just premiered it’s latest work in the spring of 2017 called Bucko: Whaleman! which shanghaied the audience into a whaling voyage where they became colluders in a destructive plot to kill a record number of whales to harvest their oil for capital gain. Ross' work has received numerous awards including a Theatre Bay Area Award the San Francisco Best of Fringe Award, Theatre Bay Area's Titan Award and the Artistic Risk Award at the Vancouver Fringe Festival. Ross works for the Medical Clown Project bringing joy and agency to patients in hospitals in the Bay Area. 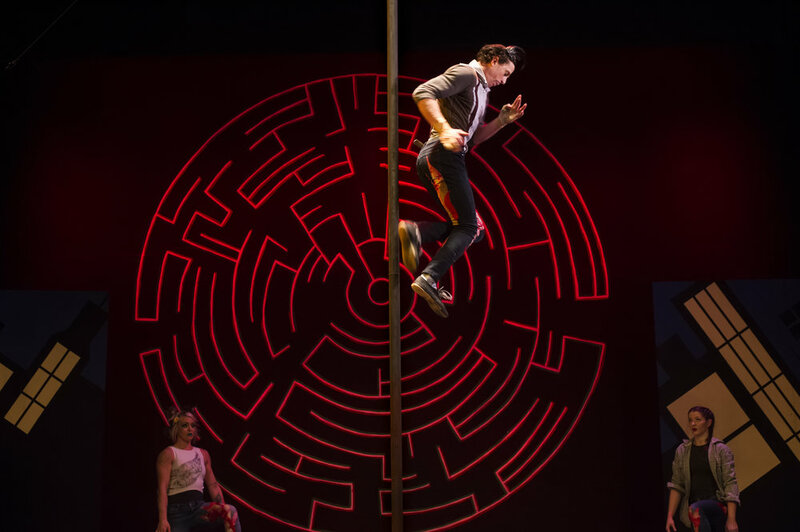 Ross is a graduate of the Professional Training Program at Dell’Arte International School of Physical Theatre, as well as the Professional Acrobatic Program at the San Francisco Circus Center. Dell'Arte is home to the premiere center of the actor-creator with over 1000 alumni from over 41 countries. Dell'Arte also houses the the first accredited MFA program in "Ensemble Based Physical Theatre" in the western hemisphere. For more information on Dell'Arte and it's unique programs, visit the DAI website. For archived posts from our former blog, go here.